“It’s very important for workers or any individual to replace a table saw blade when needed, right?” That time knowing only how to clean a table saw blade or how to sharpen a table saw blade are not enough. That’s why; you must know how to change a table saw blade. On different work projects, well performances much needed with efficient knowledge about the professional tools. When blades become blunt, it requires a new one for replacement. In this article, I will let you learn about this in details. The ultimate procedure of changing the blades is very simple and easy to do. Let’s proceed on discussing on the topic. First of all, you need to unplug the table saw from the electrical socket. Otherwise, chances are there to face sudden and unwanted accidents. That’s why you must turn it off. Make sure, you let the saw sit for a while. This will enable the tool to drain off the overall power. Ultimately, this is just for your safety. In this step, find out the blade plate, I mean its position. In most cases, it is located on the bottom surface of this machinery working tool. This metal plate is necessary to be detected to remove. For an instance, I would like to share a thing with all of you. Mostly, the blade plates are securely covered with two strong screws. They are respectively on the backward and forward position. All just you have to do is to loosen the screws and remove the blade plate from its position. Once, you succeed in removing the blade plate, now it turns for the blade to take a side. For more protection, put a little block of wood there to discourage it on going for accidental turns. Remove the nut against the blade by turning it anticlockwise. Use a wrench to do so. Keep it securely because you need it after the work. Position the new blade to the front side of the saw nearly to the teeth of it. Keep the nut and washer properly in safety. Use a wrench to make the screws tight. Turn it by clockwise to effectively reconnect it. At this section of the article, you have to reinstall your blade plate. For doing so, you must use a screwdriver. Your unplugged table saw is needed to be plugged again in this section. Install the power configuration and make it live. Have a closer look the running blade. As I have mentioned before that this total procedure is very simple. 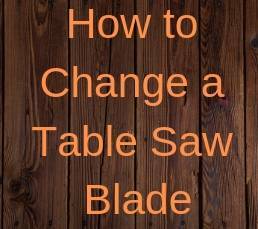 By now, you have come to know in-depth details about how to change a table saw blade. When you have to change the blades for different reasons, it never will bother you again I hope. For handling different construction project, this learning must aid you a lot.